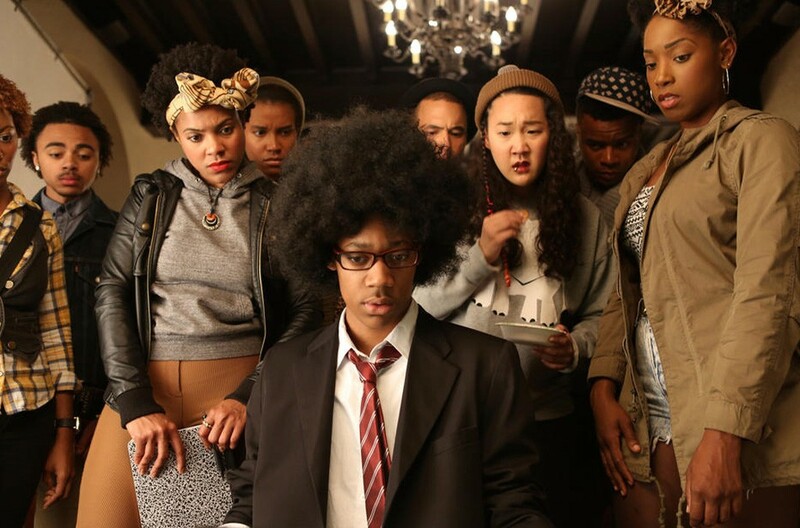 Odd man out: Race isn't the only dividing factor in Simien's college comedy of manners. There's a throwaway joke in Justin Simien's race-relations satire that some viewers will find offensive and others will find revelatory of what the movie is really about. Members of the Black Student Union at a historically white college meet to discuss an ongoing campus outrage. One regular attendee, who happens to be Asian American, suggests they join forces with the parallel Asian American group next door. As her companions turn to stare at her, suddenly wondering why she's not with "her people," she shrugs and says, "You have better snacks." It's not a joke about any particular ethnic group, but about people per se — whatever our official affiliations or ideals, sometimes our bellies win out. (Brecht famously made the same point in The Threepenny Opera.) Making his feature debut with this Sundance word-of-mouth sensation, writer-director Simien courts controversy with his frank, present-tense treatment of American racial tensions. Neither an extended rant nor a campaign speech, Dear White People asks us to question our own tendency to go where the snacks are — and maybe, just maybe, to laugh at it. It's not hard for liberal white moviegoers to shake their heads at the historical atrocities depicted in movies like 12 Years a Slave, The Butler and The Help. But college student Sam White (Tessa Thompson) has more contemporary targets in mind when she offers satirical advice to "dear white people" on her campus radio show. With pronouncements like "The minimum requirement of black friends required to not seem racist has just been raised to two," she underlines tensions at her elite school. Sam's provocations catalyze a host of competing campus interests and enough plot for three movies. The white president and the African American dean (Dennis Haysbert) are already subtly at odds — as are their respective sons, one of whom (Brandon P. Bell) is secretly conflicted about his role as a tension-smoothing campus leader. High achiever Coco (Teyonah Parris) is so eager for a spot on a reality show that she'll coolly embody any stereotype she's asked to. And Lionel (Tyler James Williams), who's nerdy and gay, just wants to find a crowd that won't mock him or play with his Afro. Everything comes to a boil when a student group launches the ultimate provocation: a party reminiscent of Dartmouth College's infamous "Bloods and Crips" gathering. The dialogue in Dear White People is beyond quotable, the characters genuinely nuanced, and the performances witty and compelling. Yet the film never quite coheres: It feels less like a story than a set of thought-provoking sketches. Maybe that's because the plot has too many strands, including abrupt revelations introduced without foreshadowing or aftermath. Maybe it's because Simien mixes his fierce critique of racial stereotypes with a few too-familiar dramatic ones, like the dean's son's daddy issues. Maybe it's because the film is so driven by rigidly staged scenes of people talking at and past one another that it never gives us time to breathe. Maybe campus satire is just a tough genre to pull off: Dear White People reminded me of Whit Stillman's Damsels in Distress, another frustratingly almost-there attempt. Simien and Stillman may have different ideological bents, but they both portray smart young people trying to reshape the world in their image — and, inevitably, failing. Flaws aside, Dear White People casts a floodlight on Hollywood's dearth of good roles for actors of color — even as it hints that no number of high-minded speeches at the Oscars will change that. What could tip the balance is moviegoers' self-interested desire to see more of charismatic performers like those featured here. Simien's caustic message resonates at many levels: If you want to change the world, be sure to bring good snacks. And if you want to open minds, start by entertaining them.